Examples, solutions, videos, and lessons to help High School students learn how to apply concepts of density based on area and volume in modeling situations (e.g., persons per square mile, BTUs per cubic foot). 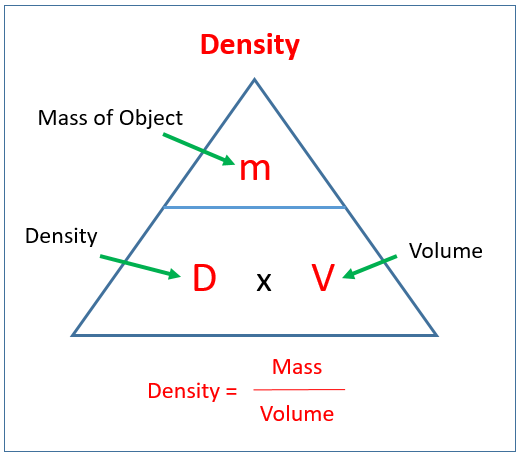 The following diagram gives the Density-Mass-Volume formula. Scroll down the page for more examples and solutions. How to use the Density Mass Volume formula triangle and find volume of shapes. It goes through a couple of examples of finding mass. Simple problems dealing with density formula (D = m / v). Solving density word problems using the formula triangle. Learn more about density and practice calculating using word problems. Density is how much mass is contained in a given volume? This video shows the equation for Density and gives 2 example problems. What is BTU (British Thermal Unit)? A short explanation of how to calculate water temperature rise in ц, given certain BTUs per hour.